Can you create a good eLearning course in just 60 seconds? How soon will AI-learning become our everyday reality? Do you need to buy a VR headset right now so you don’t miss the bus? At DevLearn 2018, they’ll touch on all these questions. For three days this October, Las Vegas became a hub for eLearners, educators, instructional designers, and learning managers from dozens of countries. They all came to share innovative ideas and improved workflows, trailblaze emerging trends, and meet the industry’s movers and shakers in person. The event was super exciting, with no small help from the fact that it took place in the heart of the Las Vegas strip. With sessions on everything from crafting bite-sized content to creating a digital learning ecosystem, DevLearn was a perfect venue to learn about all the new tricks and technologies in one place. Among the most discussed themes were VR classrooms, augmented reality, and AI assistance in learning. We talked with several eLearning experts, including the eLearning Guild Director of Research Jane Bozarth, to learn how soon, in their opinion, these hot trends would become everyday reality for learners. They argue that the adoption of AI, 360-degree video, and VR classrooms is still in process and will take years to come to fruition. However, augmented reality is likely to take over the eLearning landscape in the next couple of years; the content is easier to produce and learners don’t have to get special equipment like Oculus Rift, because they already have smartphones. We really enjoyed meeting like-minded people face-to-face and discussing topics we’re passionate about: rapid authoring, learning on the go, and great eLearning content. 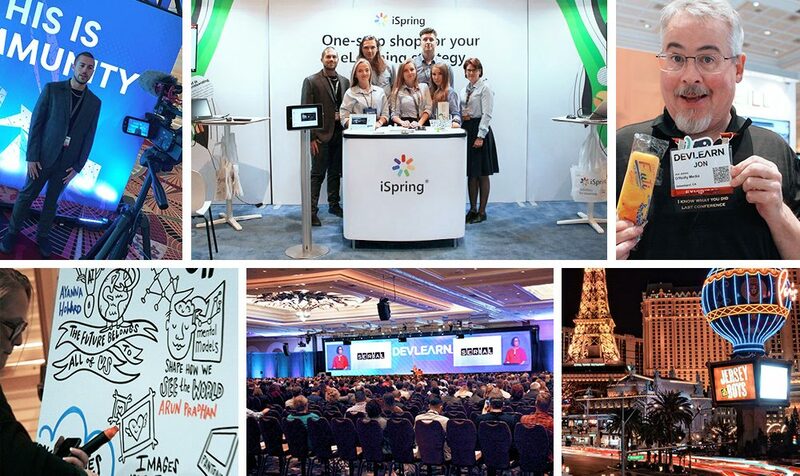 At the iSpring booth, we presented the “Course in 60 seconds” challenge. 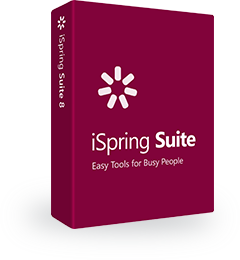 Over 200 visitors took part and were astonished to discover that it was actually possible to accomplish with iSpring Suite. How? From one intuitive tab, you can access a course and quiz builder, dialog simulations, content library, video studio, and everything else you need for eLearning, all at a moment’s glance. This year, we were happy to have two absolutely brilliant speakers deliver sessions about iSpring Suite. Richard Goring, a presentation professional and visual learning enthusiast, revealed how to easily create compelling and visually attractive content in PowerPoint which learners enjoy diving into. Michael Cerantola, an expert in eLearning authoring and publication design, delivered a session on how to turn dull slide-by-slide courses into engaging and dynamic content using gamification elements, branching scenarios, and quizzes. The sessions attracted dozens of attendees, and Michael stuck around at the iSpring booth afterwards to chat and answer questions. He sure did get a lot! Soon, both Richard and Michael will speak again on those same topics, and if you didn’t make it to DevLearn this time, be sure to attend their live webinars. We really think you should check it out: the free advice these experts drop is super handy, and will spare you many long hours of research and pricey consultations. DevLearn 2018 was definitely the place to be this October for all the top players in the industry. We loved every minute of it and left the expo with a lot of inspiration and tons of new ideas.